Dreams do come true with this Pink Provincial Princess Carrige standee for your photo booth prop! And it's free standing too! Dreams do come true with this Pink Provincial Princess Carrige standee for your photo booth prop! These memorable pictures will be the talk of the town. 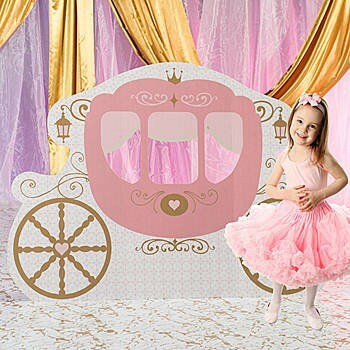 Our free-standing Pink Provincial Princess Carriage Standee features a classic carriage design in the colors of light pink and gold.